Savvy Spending: Panera Bread: Join MyPanera Rewards and get a FREE Bagel everyday for the rest of the year! 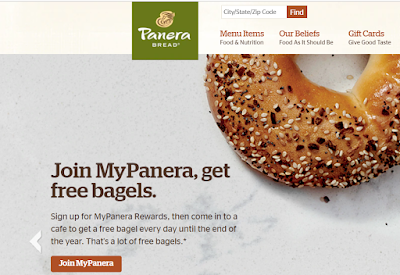 Panera Bread: Join MyPanera Rewards and get a FREE Bagel everyday for the rest of the year! Panera Bread is offering a free bagel every day until the end of 2018 if you sign up to MyPanera Rewards as a new member! If you aren't a member yet, GO HERE to sign up! You'll also receive other great promotions, a birthday freebie, and more!